Preheat oven to 400 degrees. Make Cooper’s corn bread muffins. Make Cooper’s corn bread muffins (Recipe below). Tear apart into approximately one-inch pieces. Place in a large mixing bowl and drizzle 1/3 cup olive oil over bread cubes and toss with hands. Place on a cookie sheet and toast in oven until golden brown. Remove and set aside. Heat remaining olive oil in a large pan on medium heat and cook onions, apples, carrots, celery and garlic until just soft, about 5 to 7 minutes. In a separate pan, brown sausage until cooked through, about 5 to 7 minutes, breaking it up into pieces with the back of a wooden spoon. Combine vegetable mixture and sausage in bowl with toasted bread cubes. Add chicken stock and mix thoroughly. Place in a lightly greased baking dish (9x12 works best) and bake for 20 minutes. 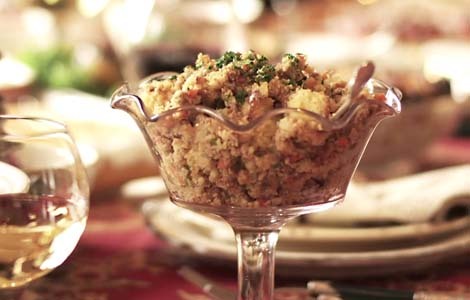 Stuffing is a forgiving recipe. As Cooper mentioned, he happened to have prunes on hand and added them to create a special version of his grandmother's stuffing. If you don't like prunes - leave them out. No one will know the difference! !